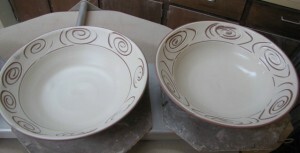 Here are a couple of the serving bowls that I slipped yesterday. I went ahead and did some wet drawing through the slip. I've always loved the Horse Eye plates from the Seto kilns and this rim deco is my homage to those dishes. I'll probably draw an owl in one of these and I'm not sure yet about the other. I got my truck back from the body shop today. It looks good as new. I didn't really blog about it, but a while back my step mother accidentally backed her car into mine. I had a pretty big dent in the passenger side there for awhile. It's nice to have it fixed now. All for today. Bisque kiln loaded. See ya on Friday!